We are currently between Books 5 and 6 of the Kingmaker Campaign I am in. Because our GM has been tirelessly working on this campaign for over two years I thought it would be an excellent idea to fill in for a bit. This will (a) give him a breather and (b) allow him to experience as a player what he has worked so hard at as a GM. As we normally do side adventures between AP books I decided to take on the penultimate side adventure. 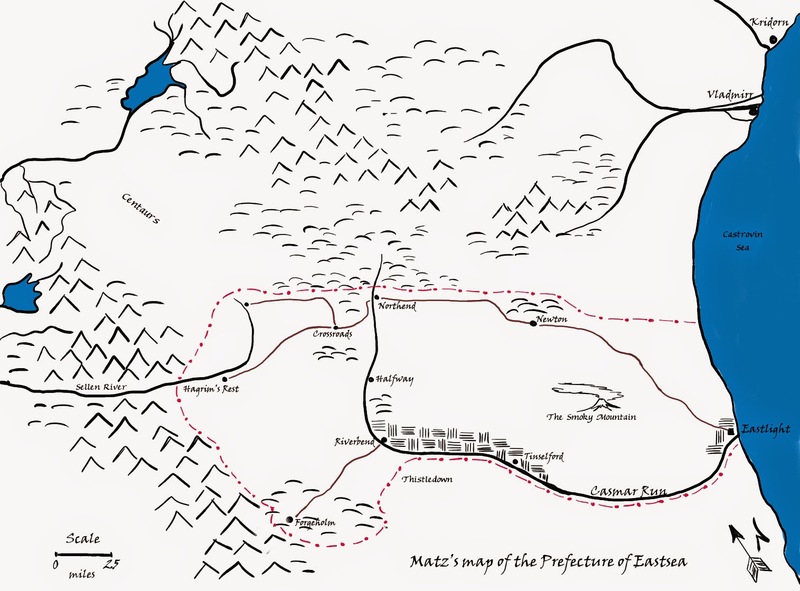 As there is very little published for 15th level characters in the River Kingdoms area of Golarion and since one of our characters wanted to "push east" to create a holding on the Castrovin Sea I decided to run with that plot line. The map for this area is based on the maps I made last summer. When designing that map, I just extended the local topography down, allowing mountain chains to trail off and taking what few cues I had from existing sources. That was the easy part. The hard part was coming up with a history and explanation for why this area was never settled. In my opinion, the closeness of a navigable trade route to Casmaron should make that area very popular. So, something must have happened. So, without further adieu, here is Eastsea as it appeared on the eve of its destruction (as researched by one of the party). The Prefecture of Eastsea - as a PC handout. I still say there's just way too much land where you say there's land. And that there should probably be more mountains. Ah well, Paizo's fault for basically not even bothering with the area - the size discrepencies with the published materials was already covered, you this is basically as good as anything you'd get. Still following this by the way. Sorry I haven't been publishing. Two things got in the way. One - I ran the party through the module I created to go with the map, so I was spending my free time on that rather than this blog. Two - we decided that this summer would be a good time to move house. So, I've been working on that.